The lemon peel brightens grilled fish. 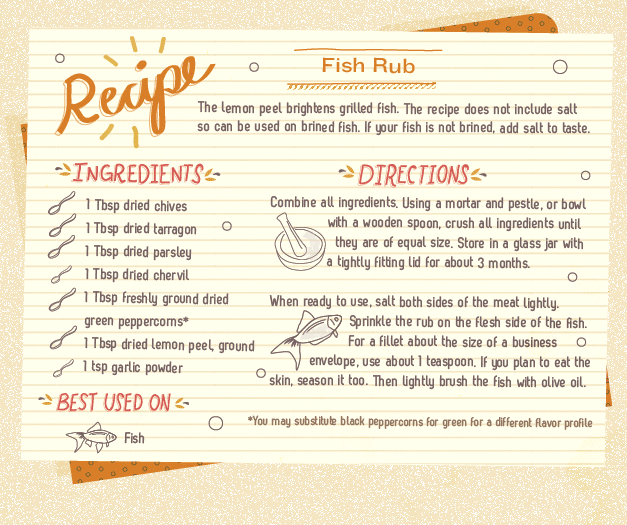 The recipe does not include salt, so can be used on brined fish. If your fish is not brined, add salt to taste. *You may substitute black peppercorns for green for a different flavor profile. Directions: Combine all ingredients. Using a mortar and pestle, or bowl with a wooden spoon, crush all ingredients until they are of equal size. Store in a glass jar with a tightly fitting lid for about three months. When ready to use, salt both sides of the meat lightly. Sprinkle the rub on the flesh side of the fish. For a fillet about the size of a business envelope, use roughly one teaspoon. If you plan to eat the skin, season it, too. Then lightly brush the fish with olive oil. Cover, and refrigerate for at least 30 minutes.